Two luxury hotels in Mumbai are re-opening, less than a month after they were heavily damaged in attacks on the city that killed at least 170 people. The Trident-Oberoi and Taj Mahal Palace hotels were among prominent locations in the Indian city struck by 10 gunmen. Both hotels were the scene of fierce battles between police and the gunmen that lasted for several days. About 80 guests and staff at the hotels were killed as the gunmen went on a shooting spree through the buildings. Nine gunmen were killed and one is in police custody. Less-heavily damaged sections of the two hotels are being re-opened in the run-up to Christmas. More than 1,000 guests have been invited to a re-opening party at the Taj on Sunday, where 268 rooms are available, hotel officials said. Rattan Keswani, president of Trident Hotels which owns part of the Oberoi, said he felt "deep pride" for the work his staff had done both during the 26-29 November attacks, and since. "There is definitely a huge amount of sadness in everybody's mind," he said, but added that he was proud of his staff for being "100%" committed to re-opening the hotel. 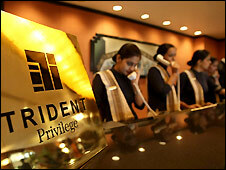 A hundred of the 550 guest rooms of the Trident section of the Oberoi hotel would be occupied on Sunday night, he said. He said the hotel would be fitted with surveillance systems, baggage scanners and strict security. While the modern Tower wing of the Taj is re-opening, the 105-year-old main section of the hotel is still closed, requiring extensive renovations to its ornate wood and marble interiors. India has blamed the attacks on the Pakistan-based militant group Lashkar-e-Taiba (LeT).